At this point in the summer, it’s best to be sure you’re surrounded by pals and easy-to-build drinks that are scaled for more than just you. Summertime, late summertime especially, isn’t the time for quiet solo contemplation after all. It’s time for simple and swell parties with the below mix (also good to have fruit juice, to ensure you don’t get sick during these late summer weeks, and brandy because, well, brandy needs you and you need brandy – but that’s as much contemplation as we want). Oh, this’ll serve around eight, depending on how hot it is. If it’s really hot, might want to keep it to, oh, six, seven max. And get extra ice. 1. Combine the peaches, apricots, and simple syrup in a sturdy pitcher, the kind you use when outdoors in the summer. Using a muddler or long wooden spoon, muddle the fruit and syrup well. 2. 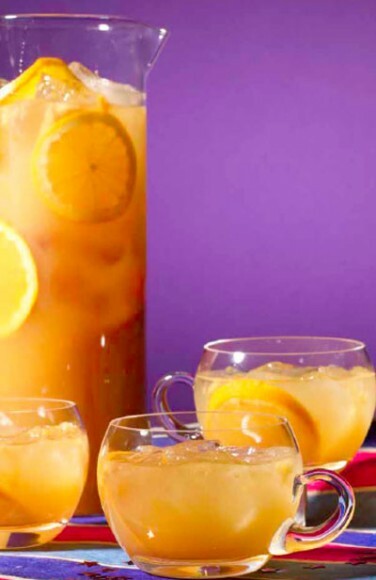 Fill the pitcher halfway full with ice cubes, and then add the brandy and orange juice into the pitcher’s melody. Stir well. 3. Carefully add the Prosecco and orange slices. Stir again, well. Serve in wine glasses, getting a slice of orange in each glass. A Note: There will be some leftover fruit here – you should eat it! Or, if that kind of thing makes you icky (well, it shouldn’t in summer, but who am I to judge), you could actually strain out the bigger bits, early in the process. But I wouldn’t. There are times, when the Mercury’s rising and that big ol’ ball of heat in the sky is high overhead, when you want a classy drink, but one that isn’t too tough. A drink that has all kinds of flavor, but without involving any sweat (or little sweat) to make. A drink you could sip after a long day of work while the sun starts its long slow trip down westward, as well as during a family brunch on Sunday when you’re waking up slowly. Well, this is that drink friend! It covers all those bases, though admittedly it might be best during the Italian aperitif hours, those beautiful moments before dinner (let’s say 5 to 7, though they can arrive a stitch earlier or later) when you want to have something a little effervescent and light, but still with character and taste. All those characteristics come together here with just two ingredients – and a lemon twist – starting with Mionetto Prosecco, specifically the DOC Treviso brut version (though all the Mionetto Proseccos, made since 1887, are worth tracking down). 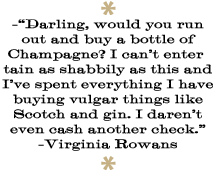 The Treviso brut is nice and dry and crisp, with apple and peach and flowers lingering on the tongue, along with a hint of honey. Here, it’s mixed with another Italian number, the newest sibling of renowned Galliano (the L’Autentico golden liqueur in the memorable bottle), Galliano L’Aperitivo, just recently becoming available stateside. An amaro, or bitter, it boasts over 50 ingredients, including a bouquet of citrus – orange, bergamot, tangerine, grapefruit, others – and a mix of herbs and spices like cardamom. The flavor’s rich, with all those orange-y citrus notes, herbaliciousness, and a hint of bitter. Together, these two Italian stalwarts come together beautifully – with lots of fruit flavor, but with a dryness that is swell in summer, when you want to keep the cloying nature of some drinks far away. The color is also rather amazing, adding another welcome touch. 1. Add the L’Aperitivo to a flute or comparable glass. Top with the prosecco. 2. Carefully stir in a manner that brings everything together without being wacky. If your prosecco isn’t really chilled, or if it’s extra hot out, add an ice cube. 3. Garnish with the twist. Give a toast to the sun, and to Italy. I say, go into January with bubbles; go out of January and into February with bubbles. And love, of course. And Parfait Amour (which, you know, gets a bad rap – some of it deserved, as it can be a sickly sweet kind of love at times). But damnit, it’s a worthy love here. Ya’ hear? And this drink (which itself can run sweet for some – but on occasion sweet isn’t bad. The orange juice, if fresh as the driven snow or some such, should help balance. You could also drop the simple altogether, now that I think about it. Again, though, you may want to sweet up. That’s okay, too. ), as well as being a good end-of-the-year’s-first-month choice, is also not a bad idea for you and yours to snuggle with on the up-coming Valentine’s Day. It checks the boxes for that: ingredient with “love” in title, sparkling and classy, Peychaud’s for health, and gin to base it all on. See what I mean? 1. Fill a cocktail shaker halfway full with ice cubes. Add the gin, Parfait Amour, simple syrup, orange juice, and bitters. Shake well. 2. Strain into a flute glass. 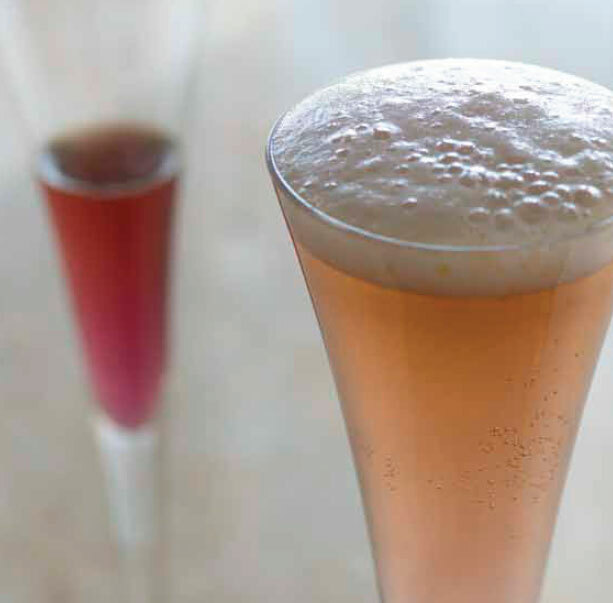 Top with chilled Prosecco. Be loved. 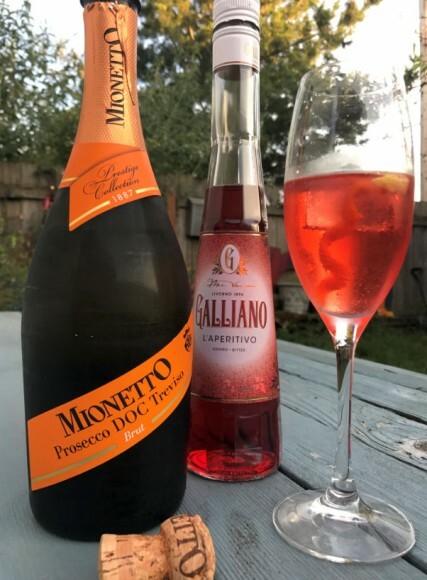 At some point this month, I myself will be in Italy, and I can’t be happier about it (having lived there once, it’s easy to see that I am a big fan), and in a way this drink is a bubbly celebration of that happiness. Though, it’s also perhaps a more serious number (not in a bad way, at all) than some bubbly Italian drinks. Howso? It starts with grappa, which I love, and which is of course a cousin to wine, and as you probably guessed by the “bubbly,” this also has Italian sparkler Prosecco. Let’s hold on that for a second, to talk about the third ingredient, Cynar. A member of the digestif amari family, Cynar is crafted from artichokes along with 12 other herbs and plants. It’s a wee stitch bitter, but has a great smooth herbal-ness and a small comforting sweetness, too. It’s swell solo, but also in drinks, and plays well with the strong grappa here. 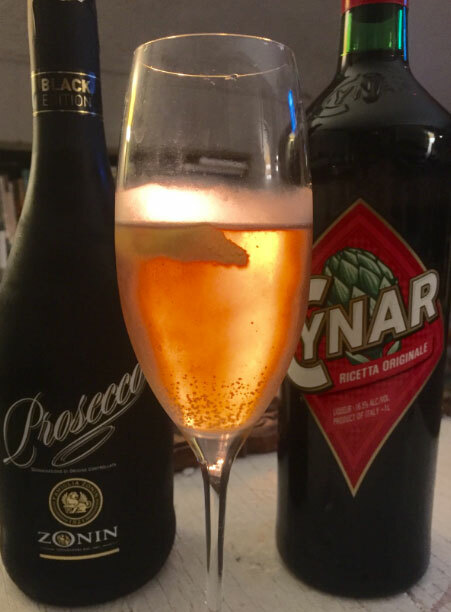 But back to the Prosecco – to hold up to those other two strong personalities, you need a bubbly with its own strong sense of purpose and flavor, and here I went with Zonin Black edition (a bottle came in the mail recently – yes, I was born under a good sign). It’s a slightly spicier Prosecco, with cardamom hints alongside apple and a little floralness. Combined with our other two Italian imports, this makes for an effervescent drink that can be had both before and after dinner, and perhaps savored more than most. 1. Fill a cocktail shaker or mixing glass halfway full with cracked ice. Add the grappa and Cynar. Stir well. 2. Strain into a flute. Top with the Prosecco. Stir to combine. Garnish with the lemon twist. It’s only fitting to have legendary Italian favorite Campari as a core ingredient in a drink that’s all about love for those days, sometimes in September, sometimes in October, which bring a more summery-ness to fall – extra sun, an extra digit or two on the temperature, or just that feeling summer has. Why Campari? Well, Campari, if you didn’t know, is all about love. 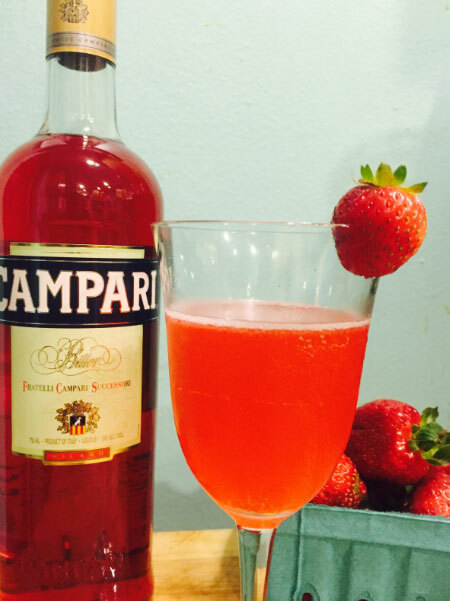 Created in the 1800s in Italy by Gaspare Campari, at first Campari was only available throughout Italy, where it became very popular. Then, Gaspare’s son Davide was born, grew up, grew to love the liqueur named after his family, and starting working at their café, the Café Campari in Milan, where he spread the legend of the liqueur. One day, when the stars where shining through the bottles filled with red in the shop, Lina Cavalieri walked through the doors. Lina was a popular opera singer, and she and Davide got along smashingly, and they started to become more than friends, if you know what I mean. Then Lina had to move to Nice, France, for an opera part. Davide was crushed, but had a light bulb moment – why not begin exporting Campari, starting with Nice? Then he would be able to bring the liqueur to those in need around the world, and also be near his lady love. That, friends, is a summer-y story, and this is a summer-y drink that’s ideal for fall (or anytime, really). 1. Add 3 of your strawberries and simple syrup to a cocktail shaker. Muddle well, but carefully. 2. Fill the cocktail shaker halfway full with ice cubes. Add the Campari. Shake well. 3. Strain through a fine strainer into an enchantingly summerlike goblet. Top with the Prosecco. Garnish with that last strawberry (put a little slice into it, so it fits cozily on the rim). This bubble number is ideal for taking your New Year’s Eve celebrations from mundane to insane (in the good way), from dull to dandy, and from so-so to go-go. Not only does it take the spotlight drink into another realm of awesome, but as it’s also a drink that inducing dancing, it’s sure to add the hop to your New Year’s Eve step. It does take a little bit of prior planning, cause you have to make lavender simple syrup. But that’s not tough at all. Just add 1/4-cup fresh lavender, 2 cups sugar, and 1-1/2 cups water to a medium-sized saucepan. Raise the heat to medium high, and heat until it reaches a low boil, stirring regularly. Once it reaches that low boil, reduce the heat to medium low and keep the syrup at a simmer, still stirring, for 5 minutes. Remove from heat and let cool completely. Then strain it, and start singing Auld Lang Syne. 1. Add the flowers from the top of one lavender sprig, gin, and lavender simple syrup to a cocktail shaker. Using a muddler or wooden spoon, muddle well. 2. Fill the cocktail shaker halfway full with ice cubes. Shake like dancer. 2. Strain into a flute. 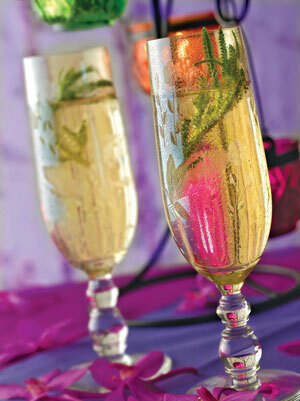 Top with chilled Prosecco, and garnish with the second lavender sprig. This bubbly beaut is ideal all through the fall holidays – a time which is, also, surprise, surprise, owl time. But the drink (as opposed to the feathered friend) is also bursting with some fall flavors: cranberries, bubbly, juniper, and, cherries. Okay, the latter may be pushing it, but as someone with a cherry tree, I tend to have them more in the fall after the harvest in the summer. Here, too, the cherry is represented by the Old Ballard Liquor Co.’s amazing Cherry Bounce, which is good anytime. The cranberries come in thanks to the Fee Brothers bright cranberry bitters, the juniper from our old friend gin (here, I went with Voyager gin), and the bubbly from Valle Calda Prosecco DOC (Prosecco being the wonderful Italian sparkling wine). The Valle Calda DOC is slightly fruity with a dandy effervescence, like an owl with a really serious hoo, hoo. It all adds up to a wonderful drink. 1. Fill a cocktail shaker or mixing glass halfway full with cracked ice. Add the gin, Cherry Bounce, and bitters. Stir well. 2. 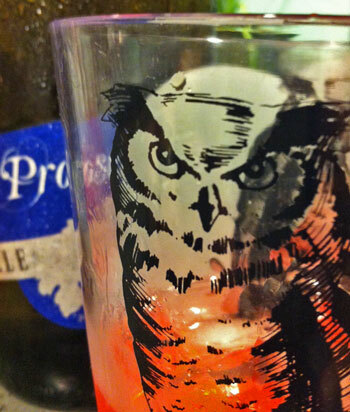 Strain into a flute glass or any glass with an owl on it. Add the Prosecco. Stir, carefully, working to combine all ingredients. A Note: If your Prosecco isn’t chilled enough, feel free to add an ice cube or frozen cranberries at the end.